Hertfordshire. ( Harry Goode is the son of England Legends Jo Goode and Andy Goode) This was a rematch from the U12 Leicester invitational final. On that occasion Rowan and Sameer won 21-13. On this occasion however it was a much tighter affair with both pairs playing some fantastic badminton, but it was once again Rowan and Sameer who came out on top 21-19. In final they came up across the biggest and strongest pair in the draw from Warwickshire, In fact Rowan was about a foot shorter than his opponents. The start of the match went totally the way of the Warwickshire pair, leading 11-6 at the mid way point. It was as though the Leicestershire pair were stunned by their opponents size and power. As the pair changed ends I (Anthony Clark LSBA coach and father of Rowan)shouted out to Rowan that the match wasn’t over and they could still win. 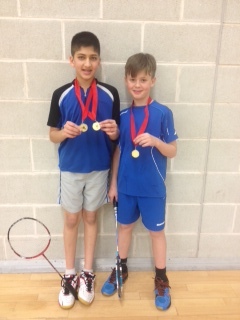 Previous Previous post: Bronze medals for Leicestershire duo in Bucks U15 tournament! We are always interested in hearing from new players. Leicestershire Schools Badminton Association Blog at WordPress.com.